In Spanish, fortaleza means strength. Our precision crafted glass drinkware collection exemplifies that quality. 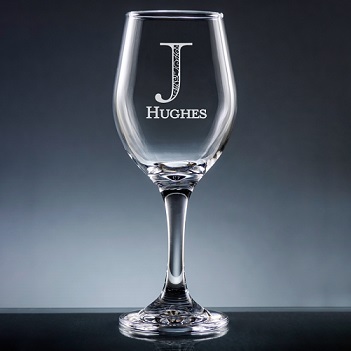 Choose a lettering style and we will engrave your initial over your name on a beautifully crafted 11 ounce wine glass. It makes a beautiful birthday gift, party favor, place setting tag, housewarming gift and more. Dishwasher safe.